Happy Tuesday, friends! Another day, another all-black outfit! If you watch my Instagram stories, you may remember a few weeks ago that my photographer sprained her ankle during our shoot. Welp, that happened right after we shot this look! Luckily, she recovered quickly and was able to rock it behind the camera at New York Fashion Week. You can check out some of the amazing shots she took on her Instagram page HERE. I'm still so bummed I missed out, but I can't wait for next year! So y'all - I literally stalked these thigh high boots during the Nordstrom Anniversary Sale - no joke. I spent like 3 days trying the find my size in stock, and it paid off. I love these boots so much that I may just have to buy them twice ;) I love them in the taupe color as well! They are a great boot to have to transition from summer to fall, because you can pair them with shorts & dresses as I did here. If you don't have a pair of thigh high boots, you need to get you a pair, and pronto! This dress is also one of my Nordstrom Anniversary Sale purchases, but I believe it's actually on sale for even cheaper now! I purchased it for 30% off, and it's now 50% off making it only $27! 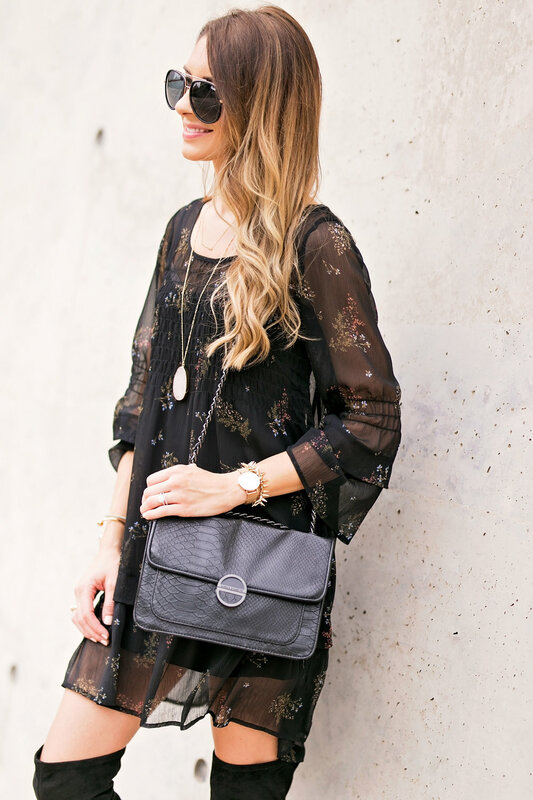 I have worn this dress quite a bit since I purchased it - it's so easy to throw on for a cute/easy weekend look. Love it! I hope you are all having a great start to the week. I've been busy preparing for my bestie's baby shower that we are hosting at our house this weekend! I'll be sure to share a few pics with y'all in the next month or so.